Licinius I, AD 308-324. Bronze follis. LONDON MINT. Size : 18.8 x 20.8 mm. Weight : 4.73 grams. Reference : RIC VII #23, Sear - 3797. Grade : gXF. Dark brown patina. Very well centred and well struck. Obverse : Head of Licinius I right, with IMP LICINIVS P F AVG around. 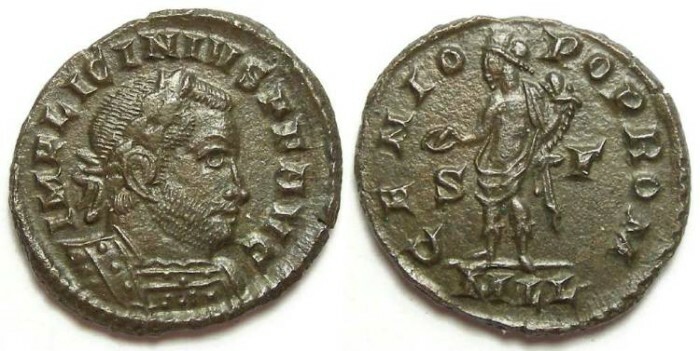 Reverse : Genius standing left, holding a patera and cornucopiae, with GENIO POP ROM around, with the mint MLL in the exergue, with mint S F in the fields.